The Nature Conservancy (TNC) and Edgartown plan to conduct a prescribed burn at Katama Airfield on Friday, April 29 in the southwestern section of the grass strip airfield, according to a press release. Visibility along Atlantic Drive may be obscured due to smoke, town officials said. Earlier this month, TNC announced plans to conduct prescribed fires this spring at the Katama Airfield in Edgartown and the 485-acre Frances Newhall Woods Preserve in West Tisbury. 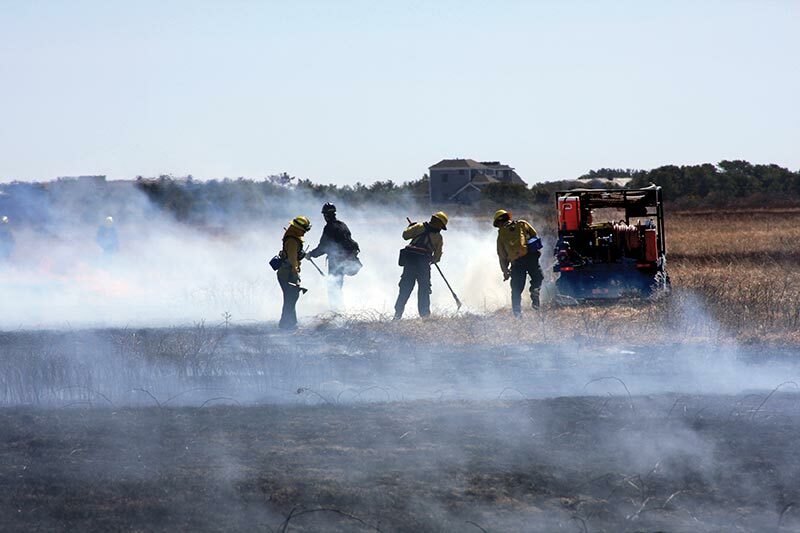 Burn dates are contingent on weather, fuel conditions, staffing, and other circumstances that will allow the burns to be conducted safely, the conservation group said in a press release. The burn window will run from April 2 to the end of May. The Nature Conservancy coordinates the prescribed burns in conjunction with personnel from Northeast Forest and Fire Management LLC, the Massachusetts Department of Conservation and Recreation Bureau of Forest Fire Control, and The Trustees of Reservations. For more information, call the conservancy’s Island office at 508-693-6287.